My big kid is a big fan of cottage cheese. She’s liked it ever since she was a wee one. She’ll happily eat individual cups of cottage cheese, plain if you please. Now, I know regular cottage cheese probably isn’t made as well as it could be so I’ve been looking for a better alternative and I was ecstatic to find the Organic Meadow Low Fat Pressed Cottage Cheese. 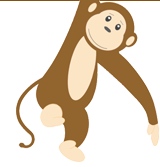 I figured this would be the perfect replacement. Product Review: What ingredients are in the Organic Meadow Low Fat Pressed Cottage Cheese? 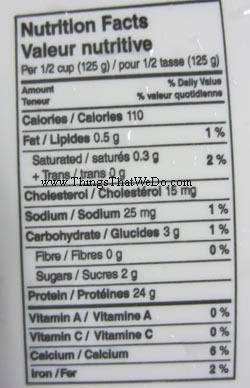 So…what ingredients are in the Organic Meadow Low Fat Pressed Cottage Cheese? 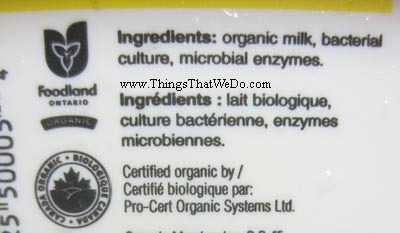 Here is the list: organic milk, bacterial culture, microbial enzyme. That’s amazing! Three simple ingredients in the Organic Meadow Low Fat Pressed Cottage Cheese. I mean, I don’t think it can get any simpler than that! Product Review: How does the Organic Meadow Low Fat Pressed Cottage Cheese taste? I’m pretty sure most of us have had cottage cheese before so you can’t help but expect that all cottage cheeses will have a similar taste. Both my daughter and I expected the Organic Meadow Low Fat Pressed Cottage Cheese to have a certain texture, a certain salty tangy taste, that could easily be eaten all by itself. Open the tub of Organic Meadow Low Fat Pressed Cottage Cheese and we were surprised to see that it wasn’t in little chunks. Technically speaking, we should have known it wouldn’t be given that it is pressed cottage cheese. 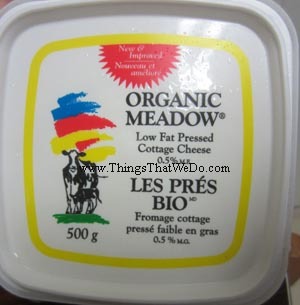 In fact, the Organic Meadow Low Fat Pressed Cottage Cheese reminds me of cream cheese but with a grainer texture. That was the end of it. My big kid decided that she did not like the Organic Meadow Low Fat Pressed Cottage Cheese and would not go near it again. I had to agree with her. 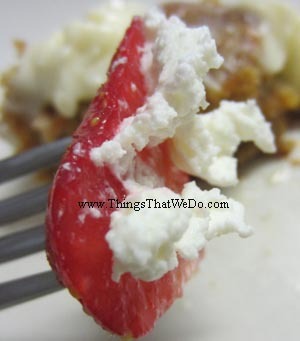 It tasted like sour cream cheese and really didn’t remind me of the typical cottage cheese. 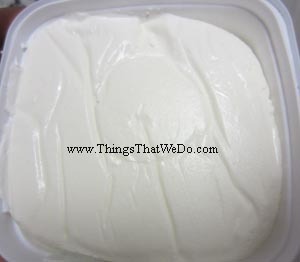 Over the next week or so I was left to find creative ways to eat the Organic Meadow Low Fat Pressed Cottage Cheese. I mean, I knew it was good for me. I just didn’t like eating it plain. As it turns out, it goes well with fruit or spread on toast with some jam and toasted nuts. It pairs well with chili but I really can’t eat it on its own. Would I ever buy the Organic Meadow Low Fat Pressed Cottage Cheese again? Sadly, at over $10 a tub I wouldn’t buy it again unless my daughter absolutely loved it. For me, I’d opt for other choices to get calcium in my system to avoid spending $10 on one single item. Don’t get me wrong, the Organic Meadow Low Fat Pressed Cottage Cheese is well made and would probably be easily enjoyed by someone else. Would I recommend Organic Meadow Low Fat Pressed Cottage Cheese to someone else? Yep. It just didn’t work for us.